A twist on the traditional bookcase, this option has glass doors that enclose each of the three shelves. And you can customize the glass panels from a variety of simple or stained glass options from the Amish Furniture Factory. The otherwise simple, practical design will withstand the test of time and can be incorporated into any existing décor. And because the center is made out of solid wood, it will last decades. Available in a variety of stains, you can customize this bookcase to match your home office perfectly. Built out of solid wood, this bookcase is ideal for a home looking for a long-lasting solution. With five shelves, there is ample room for books and belongings. The simple, practical design will withstand the test of time and can be incorporated into any existing décor. And because the bookcase is made out of solid wood, it will last decades. Available in a variety of stains, you can customize this computer center to match your home office perfectly. Pictured in oak with 4562 Light Walnut stain. This bookcase fills a corner with books or decor and uses vertical space. It's also really beautiful, handcrafted in gleaming hardwood with subtle beveled corners and elegant straight lines that go with anything. This bookcase fills a lonely corner with heirloom quality furniture. Plain sides, top and base keep the design elegant, even with beveled corners. Raised panel bottom doors protect your heavier belongings and encourage the eye to the treasures displayed on the shelves above. The 40'' Venice Bookcase has a practical, slightly widened top, tapered feet, and a minimal profile to complement any space's style. The Venice Bookcase does the job beautifully with solid wood construction that will showcase heavy books for decades. Its plain sides and tapered feet create classic style to complement any room in this style era or the next. 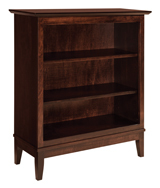 Big with plentiful shelves, the Westlake Bookcase is great for organizing your belongings. The bookcase has six wooden shelves that can stand up to the largest home library collections. Best part, this bookcase is made of solid wood so it stands level and belongings won’t damage the back of the bookcase. With the in-laid panels, arches and scroll details that define the Mission-style of furniture, this bookcase is attractive and timeless. Available in a variety of stains, you can customize this bookcase to match your home office perfectly. Tall with numerous shelves, the Westlake Bookcase with Doors is great for organizing your belongings. The bookcase has four wooden shelves and a large cabinet that includes additional shelves. Best part, this bookcase is made of solid wood so it stands level and belongings won’t damage the back of the bookcase. This bookcase is truly stylish and large enough to hold even the biggest of libraries. The glass doors open outward and have wooden panels running throughout. The clean Mission style is prevalent in the design of this bookcase which makes it popular in homes all across America. Other sizes of this bookcase are available.